I’ve never shied away from the fact that I wasn’t the biggest fan of The Dark Knight. It’s not that I think it’s a bad movie. I just happen to think it’s vastly overrated. With that in mind, my expectations for The Dark Knight Rises were set fairly low to be sure, yet somehow it found a way to still disappoint me. By necessity for this review, I’m going to need to get into some spoilers. I’d highly recommend you skip those, so here’s your capsule review: the film looks gorgeous and takes full advantage of IMAX screens. The film is also incredibly convoluted and needed to be at least 45 minutes shorter. Anne Hathaway is great in it. 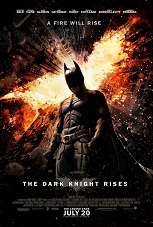 It’s a decent film, but a severe disappointment as a Batman movie. Godspeed and I hope you enjoy the film.